Yoskay Yamamoto’s Koibito is half coi fish/half boy and all awesome. For the upcoming Hi-Fructose vol.10, famed photographer Brian McCarty braved the not-so cold December waters of a Los Angeles pool just for the shot for us. To celebrate the release of the Koibito at Melrose’s Munky King tonight December 12th, we’re offering a free download of the image for screenshot/wallpaper use as well as a download image for your Iphone courtesy of Brian. Get the behind the scenes Q & A on the shot and links for the downloads below. Download McCarty’s Koibito shot for 1024 x 768 monitors here. Download McCarty’s Koibito shot for 1280 x 960 monitors here. Download McCarty’s Koibito shot for iPhone here. HF: Wasn’t the coi half of the fish slowly poisoned by the chlorine in the pool? Brian: Ugh, I’m so happy that I abandoned my original shot concept. I wanted actualfish floating around him, but the chlorine is horribly toxic to fish. Theyliterally melt. After searching in vain for a fresh water pool, I moved awayfrom the idea. The shot could have been pulled off, but I would have feltlike crap brutally killing the fish. Koibito himself seemed to be immune. Perhaps he inherited an immunity fromhis human side. HF: Who’s pool was that? Brian: It was Dave Pressler and Lisa Henson’s pool. HF: Who’s that lady in the background? Is she tail-less mermaid? Brian: The woman in the background is the lovely Zury from Munky King. She bravelystepped up at the last minute to model in the freezing water. My intention was to play off of Yoskay’s concept for Koibito. The characteris meant to express a sense of alienation, being a fish out of water. Thewoman and Koibito are disconnected despite their closeness. 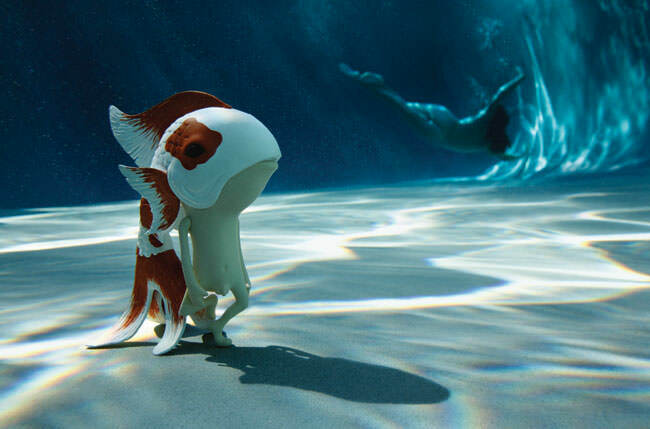 Despite beinghalf-fish, somewhat at home in the water, Koibito chooses to stay anobserver, to stay disconnected from his surroundings. The woman is more freeto experience the world, even though she is also alien to it. HF: How long did it take to set up the shot? Hanging out in a pool all day inDecember in LA must’ve been…errr, warm? Brian: It was mighty cool. This is the second underwater shot that I’ve done thatended with hypothermia. Sooner or later I need to buy damn wetsuit!All told, the shot took about three hours. I knew exactly what I wantedgoing in, and the majority of the time was spent preparing the gear and toy.This version of Koibito was still a prototype, rotocast from hard plastic.To keep him from floating to the surface, we drilled a very small hole atthe base of his head, and Mika held him underwater to shake out the air. Idoubt the prototype will ever completely drain!